Humanity matters to the Creator. Humans were placed in a Paradise planted by the hand of God Himself, because he created them, breathed life into them, and He loved them. People were healed emotionally, physically, and spiritually by the hand of Jesus because he loved them unconditionally. We, the church, the body of Christ are called to be like God in that we seek to lift up the creation and our fellow humans to a better place because we love them. We, the church, the hands of Christ are called to be like Jesus in that we bring emotional, physical, and spiritual healing to people because we love them unconditionally. But we rejected His call and instead, we, the bride of Christ are seen more by the world as a “bridezilla” of an angry, vengeful, vindictive god. We demand our way, pushing our will on a world full of loneliness, sadness, pain, death, and war. We tell people that we alone are right and that they are wrong, that we know best, that we are the fount of all that is true. We shout, condemn, and vilify. With our words pour salt on the wounds that the world, the flesh, and satan have inflicted upon their tender souls. The church, the supposed visible Kingdom of God on earth, a Kingdom meant to mirror our King who is known for His grace, and mercy, forgiveness, and unrestrained love is invisible to the world. The Kingdom of God has been usurped by another kingdom masquerading as the real thing. This kingdom is human centered and is known for it’s ungracious arrogance, merciless judgments, lack of forgiveness, and limited love. Would you want to be part of this kingdom? Would you want to follow this god? How To Turn “Heathen” Away From Jesus. Good thoughts. We just have to love louder than they hate. Mark, I think if Jesus came to some of our Churches today He would sit at the back and noone would notice Him. He would smile at love being present in some places and weep where no love is present at all. Thank you for your latest writing. It is so true. 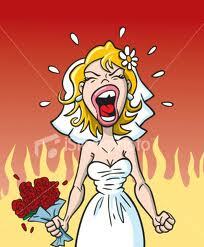 Love the bridezilla imagery. Sad but true. I laughed but then I hurt. Well said. thanks for reading and for your encouragement too. Just an aside…most conversations with anti-gay fundamentalists usually are fruitless.